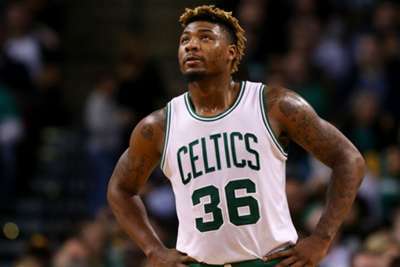 The Boston Celtics have received a boost with Marcus Smart saying he will "definitely" be fit for the second round of the NBA playoffs. Boston have been blighted by injuries this season, with superstar point guard Kyrie Irving this month joining Gordon Hayward on the sidelines for the remainder of the campaign due to a knee issue. However, Smart, who tore a tendon in his thumb in March, has assured he will be available for the Eastern Conference semifinals, if not before. "It's going well. I'm trying to stay in shape. Today [Sunday] was the first day with the new splint on to actually get out here and do something. The thumb felt well," Smart told reporters. "And like I said, we're on track for the next three weeks, possibly Game 7 of the first round, definitely second round. So we're on the right path." In 54 games this season, Smart averaged 10.2 points, 4.8 assists and 3.5 rebounds in 29.9 minutes.